Fred Balshaw was a prolific and versatile genre painter of landscapes, figures and portraits who was born in 1860 in Bolton, Lancashire, the son of Joseph and Sarah, nee Haslam. He appeared on the 1881 census as living in Little Bolton and was described as a general clerk in the county court. In the 1891, 1901 and 1911 censuses he was still in Bolton but his occupation was given as artist. Balshaw had strong links with the Fylde. In 1884 he was a founder member of the Blackpool Sketching Club and a member of the Fylde Art Society and Sketching Club, becoming its Honorary Secretary in 1926. He was also President of Blackpool Art Society in 1930. A reproduction of his painting, Ordered to the Front, was purchased by Mr C W Macara of St Annes with the object of stimulating interest in his National Relief Fund. The Buckinghamshire Herald reported on 24 February 1900 that, 'the reduced reproduction, on cards ready for framing, cost 6d and sold rapidly'. Charles Macara started Lifeboat Saturdays for the RNLI in Manchester, originally to establish a fund for the widows and orphans of 'The Mexico' disaster. He knew many of the men who died and wished to be buried near them, as he was, close to the door of St Annes Church. of the missing pictures is of Kilkree. Balshaw’s painting of a local Pilling character, The Village Violin Maker, was shown at Fylde Art Society’s 36th Annual Exhibition held in 1921 at the Grundy Art Gallery, Blackpool. In 1936 Balshaw was living at Stone House, Blackpool Road, Lea, near Preston. Unfortunately, he died on 6 October that year in Preston Royal Infirmary as a result of injuries received when knocked down by a motor cattle wagon on the Preston to Blackpool Road at Lea. The Kings Arms was an old coaching inn in Kendal which was demolished in 1934 and the area converted into shops. The vertical format of the painting gives height to the scene as does the lone, small figure on the right of the courtyard. 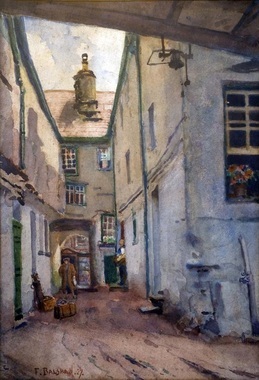 The narrowing of the courtyard and the use of darker colours in the foreground lead us into the picture giving it depth. We have a sense of looking in on the scene. It is a harmonious composition in complementary colours with no dominating element. One can imagine the artist painting this watercolour sketch as a natural light falls on the buildings below. It is warm, shadows are formed and windows opened as the work of the day continues. Fred Balshaw married Mary Helena Francks in Bolton in 1886 and it was their younger daughter, Freda Francks Balshaw, born in 1894, who was the donor. Mary Helena was born in Bolton in 1861 and died in the Fylde in 1931. Freda married Charles Sheffield Doeg in 1917 at the Methodist Church in Rawcliffe Street, South Shore, Blackpool. Charles Doeg was born in 1892 in Scotby, near Carlisle and was educated at Carlisle Grammar School. In the 1911 census he was described as a clerk. He served in the Royal Army Medical Corps during the First World War and received the Silver War Badge, which honoured those who were discharged because of wounds or illness. 6 Seventh Avenue, South Shore, Blackpool, certainly from 1924 to 1934. Charles Sheffield Doeg died in Barnet, Hertfordshire in 1967 and Freda in Bournemouth in 1986.